Pestell Paw Thaw Pet Friendly Ice MelterPestell Paw Thaw Ice Melter is designed to be less harmful to your pet's paws than other commercial ice melters. 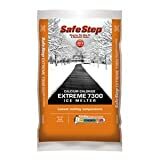 Most ice melters are made from rock salt or calcium chloride. Rock Salt ice melters have a very high ph level and over a period of time will dry out your pet's paws and cause them to crack. Calcium chloride ice melter actually creates a great deal of heat and will cause considerable pain to your pet's paws. Pestell Paw Thaw is made from a combination of fertilizer and non-corrosive products that will be less harmful to your pet. One of the ingredients is Calcium Magnesium Acetate (CMA) which is biodegradable in soil and has no adverse effect on vegetation. Other ingredients include ph stabilizers to control the ph level of the product, food grade marker for the colour, and a non-corrosive spray to make the product safer for your pet's paws. All other ingredients are fertilizer- based products that will melt ice at a variety of temperatures, while not being harmful to your pet. 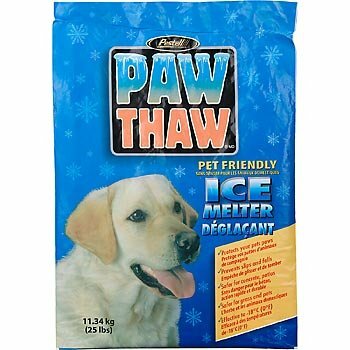 The key advantage of Paw Thaw is that while it is pet friendly, Paw Thaw is an effective ice melter. Paw Thaw breaks the bond between ice and the surface area. When Paw Thaw goes to work, it's time-released formula stays on the surface area longer, helping to control the freeze-thaw cycle.